Read Only Memory or ROM is a storage medium used in computing devices that allows only reading, not writing data regardless of the presence or an energy source. Data stored in Read Only Memory or ROM is designed in an way that it can not be easily changed. Because it is designed to hold the firmware or even an Operating System as Graphical User Interface like in Android Tablets or for debugging. If it can be easily modified, there will be problem to reset as Read Only Memory or ROM are used for System on a Chip (SOC) devices the only way to get an interface. As the data on Read Only Memory or ROM easily can not be modified, it is convinient to store data that does not need to be changed frequently. Read Only Memory or ROM has been used in many computers to data tables. This was especially efficient when the Central Processing Unit (CPU) was very slow and ROM was cheaper than RAM . BIOS usually installed on a ROM. Home computers in the early 1980s came with its operating system in ROM. There was no other reasonable alternative operating system and the external drives were usually optional. Upgrading to a new version means using a soldering iron or a group of DIP switches and replace the old ROM chip with a new one. Currently the operating systems usually are installed on ROM. Mobile Computing devices like Android Tablets usually have programs in ROM. As we have mentioned above, there is no reason to think that Read Only Memory or ROM has no use today. In fact this part of hardware is crucial in any computing even today as mentioned above, be it a home computer or a complex medical device. This Article Has Been Shared 5214 Times! Head Mounted Display is worn on the head of a visual output device, the computer generated image is projected on a near-eye display or directly on the retina. DIY Stylus needs nothing to buy in real – a piece of conductive foam, a wire and an ordinary pen like thing together works as a stylus. Google Glass for Documentation of Wound and Injury is a attempt for serious integration of IT innovations that can be used in the healthcare field. 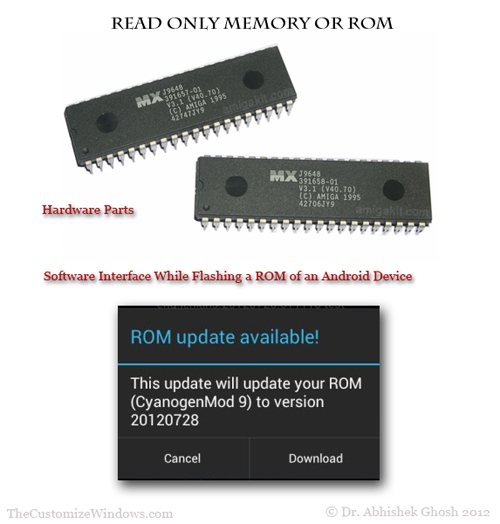 Cite this article as: Abhishek Ghosh, "Read Only Memory or ROM," in The Customize Windows, October 27, 2012, April 26, 2019, https://thecustomizewindows.com/2012/10/read-only-memory-or-rom/.